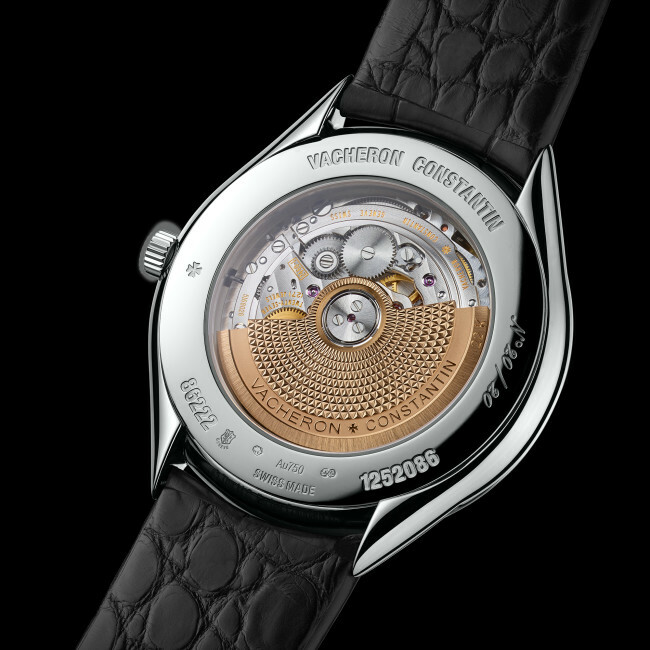 With the Métiers d’Art collection, Vacheron Constantin so far paid tribute to dance with Métiers d’Art Hommage à l’Art de la Danse collection and flora with Métiersd’Art Florilège collection. The new Métiers d’Art Les Univers Infinis collection is paying tribute, for the second time to the graphic art of tessellation. The inspiration for the Les Univers Infinis collection is the work of Dutch artist Cornelis Escher. 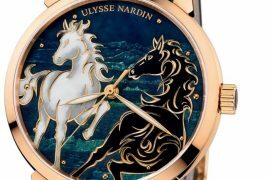 The three watch collection includes the Angel, the Lizard and, the Horseman Watches. All three intricate watches use marquetry, engraving, enameling, gem setting and guilloche work to create trompe l’oeil dials. These techniques helped create the complex elements of geometry, movement and symbolism features on dials. With its slender bezel ensuring maximum dial opening, hollowed hands allow for a greater view of the art of tessellation. The Angel Watch dial features angels and demons with angels in light and demons in darkness. 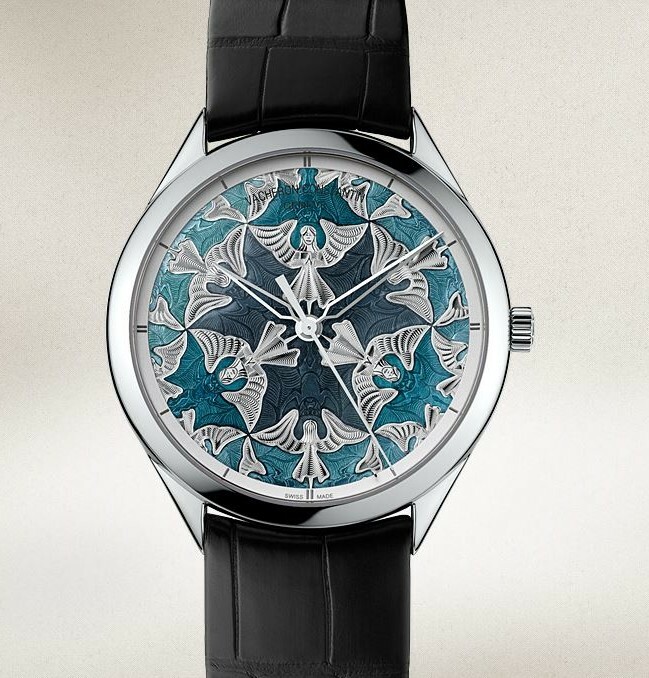 The “circular boundary” effect on the dial is inspired by Escher’s research on the subject. Techniques used on this dial includes a combination of engraving, Grand Feu enamel and, guilloché work. 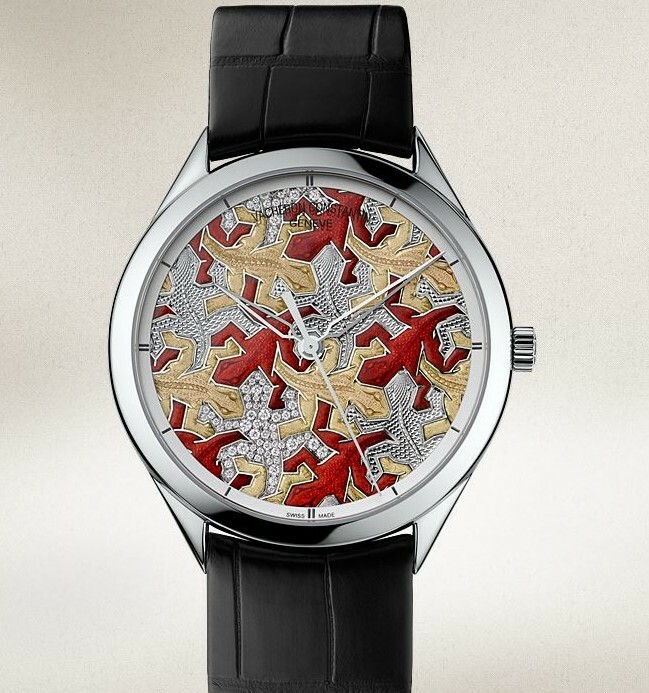 The Lizard Watch dial features red and silver gem studded lizards, as well as enameled taupe-coloured lizards. It also features Grand Feu enameling and guilloché work. 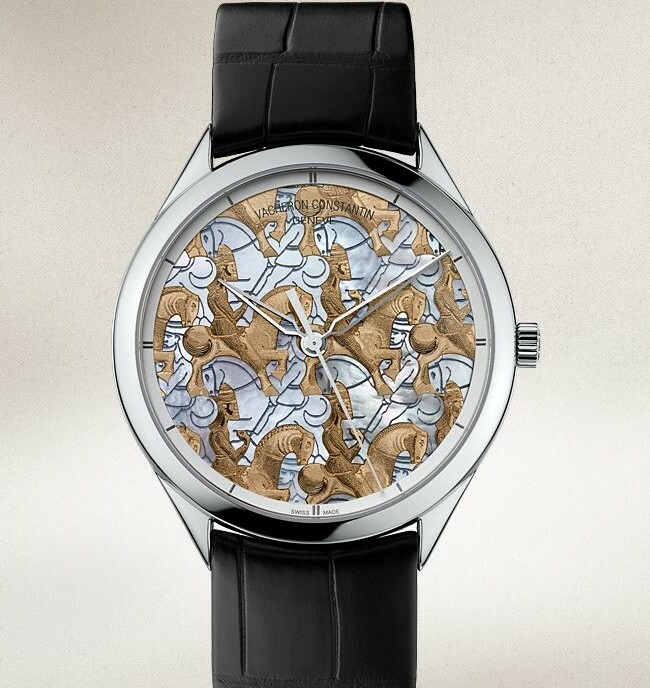 The Horseman Watch dial is filled with Ottoman horsemen in gold and mother-of-pearl marquetry pattern. At the end of the marquetry process, the engraver perfects the horsemen and horses by emptying out the details of their anatomy. Housed in an 18 karat white gold case, watches are powered by in-house developed and manufactured Calibre 2460 SC mechanical self-winding movement. The movement features an array of manual finishes, such as polished angles, hand-drawn flanks, circular-grained main plate, bridges adorned with a Côtes de Genève motif and gold oscillating weight featuring the cross weave guilloché pattern. 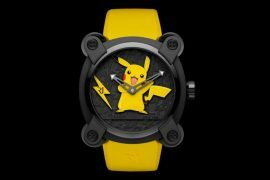 Movement is visible through the sapphire crystal case back. It is water-resistant to 100 feet (3 bars.) Watch comes on a black alligator strap with a white gold tongue buckle. Each version is limited to 20 pieces.